APBackup online help - External archivers configuration. External Archiver Configuration is a file with .EMC extension placed in the APBackup working directory. This is just ordinary Windows INI file, so you can edit it in any text editor. APBackUp allows you to edit EMC in special "External archiver configuration editor". 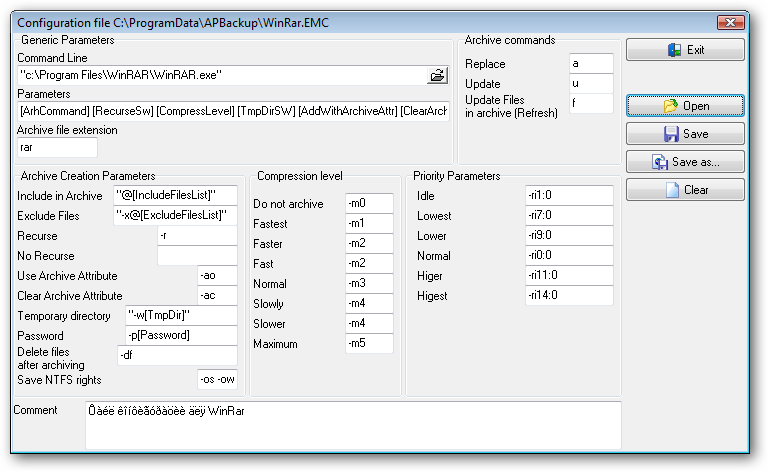 APBackUp comes with EMC files for some popular archivers (WinRar, jar, WinZip, arj, ace, ...). Select menu item "Edit configurations of external archivers" to edit the external archivers configurations. You can create new configuration or edit existing ones. See "Using external archivers" for details.